PREMIUM SUSHI MAKER. 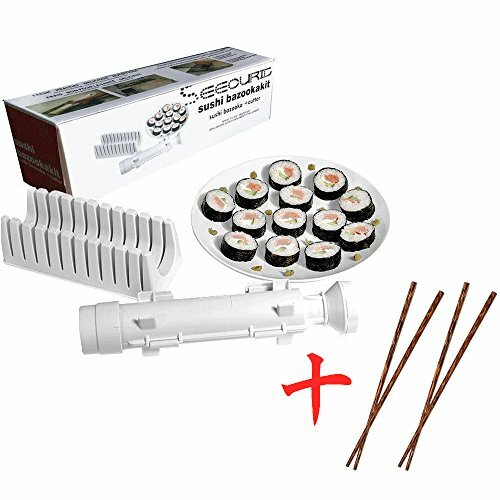 Our high quality sushi making kit gives you the tools you need to make perfectly round sushi rolls from the comfort of your own home.We are providing our customers with a top of the line sushi maker to ensure consumer satisfaction and to provide you with a fun filled night of sushi making with friends & family! HEALTHY CHOICE - Looking to add some healthy variety to your dietary regimen? With our product you can add sushi to your regular diet without spending a fortune at restaurants. Our awesome Sushi Bazooka will help you to easily prepare a wide variety of sushi rolls at home every week! EASY TO MAKE RESTAURANT QUALITY SUSHI - Add rice and ingredients into your sushi bazooka, plunge your soon to be perfect sushi roll onto a nori sheet, finally place your sushi roll on your bamboo sushi mat and roll by hand to ensure your sushi roll is perfectly round, compact, and has the restaurant quality look and feel. Great kitchen appliance for large parties or just a quality night in with the family. DISHWASHER SAFE - Say goodbye to the old rolling mats that are hard to wash and impossible to use. Manufactured using durable materials, your Sushi Kit will last you a lifetime. BEGINNER'S BEST FRIEND - Our product is so carefully designed and easy to use that even children can make sushi with it! This makes a perfect family gift for friends who enjoy sushi but are beginners. If you have any questions about this product by SeecurIT, contact us by completing and submitting the form below. If you are looking for a specif part number, please include it with your message.